After my mild disappointment with the Baked Brownie, I decided to give the Baked cookbook a second chance by trying their flourless chocolate cake recipe. Ever since I picked up a few slabs of Callebaut chocolate Oliver had been harassing me to give a flourless cake a try, so this gave me the perfect opportunity. I have to say, this recipe fully redeemed the cookbook, and the cake is probably one of the best cakes I have made to date. Preheat your oven to 350 degrees. Line a 9″ springform pan with parchment paper, then butter the pan. Using a double boiler melt the chocolate and the 3 ounces of sugar. Mix with a whisk until the two have combined. Set aside to cool. In a large bowl mix the 1 cup of sugar and the butter until light and creamy. 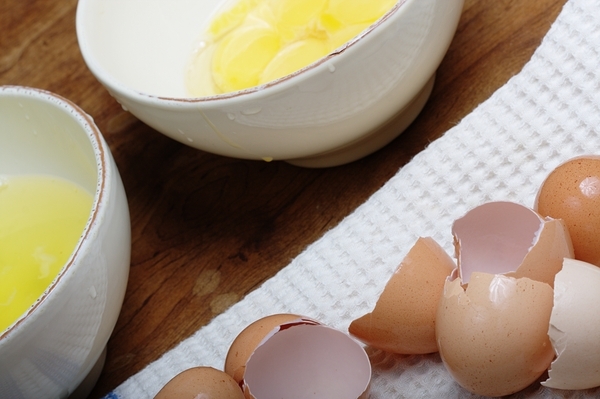 Add the egg yolks one at a time beating slowly. Add the cooled chocolate, vanilla, and beat until all combined. In another bowl beat the egg whites and the salt until they form stiff peaks. 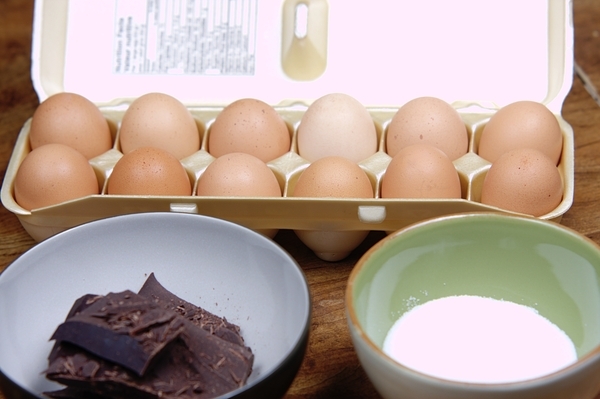 Fold 1 cup of the egg whites into the chocolate mixture. Continue to fold in the remainder of the egg whites 1 cup at a time until fully incorporated. Be sure not to over fold the mixture. Pour the batter into the pan and smooth the top. Bake for 30 minutes, rotating 180 degrees midway through baking. When the cake is ready the top should be firm to touch. Let cool on a wire rack. After the cake has cooled make a chocolate ganache. Start by chopping up the chocolate and placing it in a heat resistant bowl with the sugar. Next heat up the whipping cream until it just reaches a boil then pour over the chocolate. 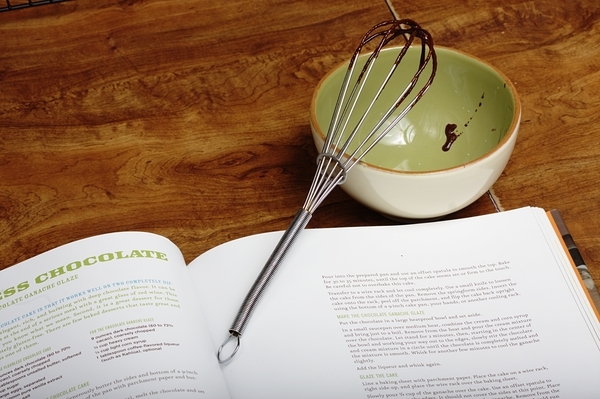 Mix with a whisk, until nice and creamy. Add the rum and stir until mixed in. Pour the ganache over the cake so that it just reaches the edge of the cake. 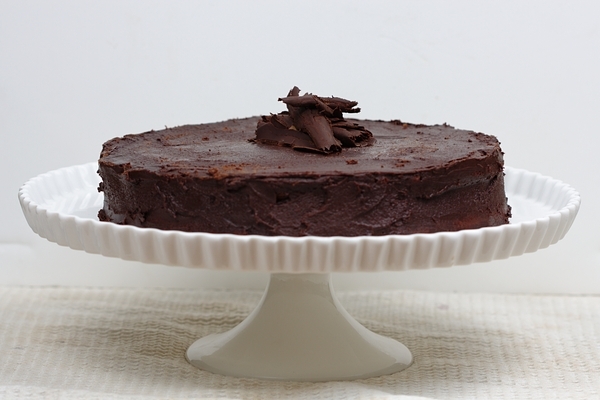 Use a metal spatula to smooth off the top of the cake. Put the cake in the fridge for a few minutes to let the ganache solidify. Then remove from the fridge, and pour the remaining ganache over the cake, this time letting it drip over the edges. Smooth the ganache on all sides and the top once more. Put the cake back in the fridge for a few hours to let the ganache set. I was really happy with this cake. I made one mistake when making it, in that I didn’t chop the chocolate for the ganache. This caused the chocolate to not fully melt. I had to put it back on top of the double boiler (never a good idea) which caused the chocolate and the fat to separate. I was able to salvage things slightly, but overall the I kind of screwed up the ganache. Nobody seemed to mind though, as everyone who tried it, really enjoyed this cake.